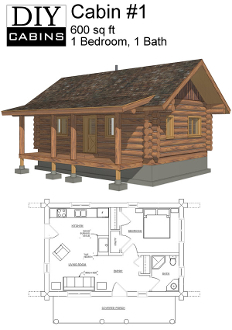 Log Cabin #1 is a 600 sq ft, 1 bedroom and 1 bathroom design. Designed using a 12" average log, this cabin is perfect for the simple getaway cabin. It also has a 6'x26' covered porch at the front. Add an optional woodburning fireplace to create the perfect feel.